Today, I would like to review Coach Poppy Flower that I've gotten from SaSa's Fragrance Fair & Awards 2013 ♥ I was really excited when I got it because I'm in love with it's sweet floral scent. The fragrance also exudes a fresh floral & fruity character, which is supposed to be more refined and romantic than the original. It opens with citrusy notes, wet ivy, blackcurrant and lychee. These fruits serve as an introduction to the heart of jasmine, rose, water lily, peony and raspberries, and it has amber wood, sandalwood, apricot skin and musk in the background. As the name suggests, this one smells a lot more like flowers to me than the original. 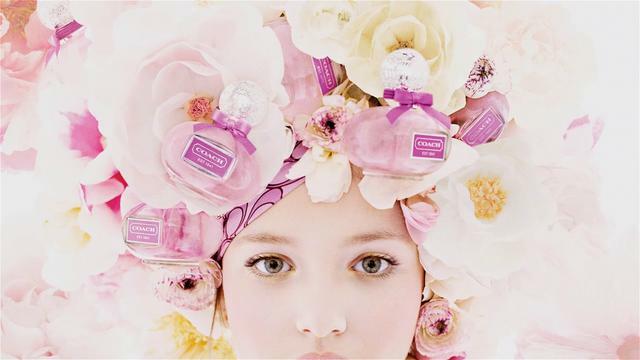 It's definitely deeper, sweeter and more floral than Poppy, I feel like a bouquet of flowers when I spray it on me. Too bad I'm not catching any of the citrusy scent from this perfume, I only got the sweet and fruity side. The packaging of this perfume is so adorable, it's a little glass sphere with a silver topper and a pink bow. On the topper, it has "Coach Poppy est. 1944" and hearts engraved all over it. The "Coach est. 1941" on the front is simply a sticker, which is easily peeled off. I have a hard time griping the perfume during application, I have to be extra careful with it. Nonetheless, the packaging is very classic, simple and really cute, I have to put it on my dressing table! The scent is long lasting and not very strong, I still can smell hints of this scent throughout the day. I think it really suits when I'm in a girly or dressy style, I can't imagine it with tees and jeans. Coach Poppy Flower EDP is in the running for SaSa's Best Woman's Fragrance, you may check it out the other nominees here. Do remember to vote for Coach Poppy Flower and get RM20 cash rebate voucher!